A Blue Slushee --- one of those sweet drink concoctions consisting of frozen chemicals and sugar, usually an impossibly bright color that guarantees it is not "natural" was the motivation for this post. I've written previously about the importance of the "Entry Sequence" (things like reasonable parking fees, pleasant guards and admission personnel, easily understandable admissions prices) in setting a pleasant starting tone for a museum visit. It turns out that the "Exit Sequence" for a museum visit is just as important, and that's where the saga of the Blue Slushee drinks on sale in the lobby of "The Franklin" (formerly The Franklin Institute of Science) in Philadelphia begins. Our family, consisting of two adults and four kids, had arrived right at opening time on a busy day, so we were able to park our car in The Franklin's parking structure and get our tickets to go inside without much fuss. After several hours of zipping around the various exhibit halls (including at least six round-trip passes through The Giant Heart for our youngest) we were all ready to leave and get outside to grab a late lunch. 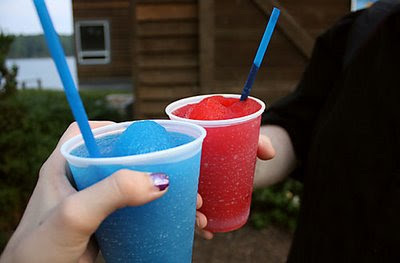 However, to exit The Franklin we now had to march right past a stand smack in the middle of the lobby selling what could only be generously termed "junk food" including big clear plastic cups of fluorescent blue Slushee drinks. Needless to say, our hungry, and slightly overstimulated, 4 year old took one look at the bright blue treats and wanted one right away. When we gently refused, she had a fuss all the way to our lunch destination several blocks away. • Why is The Franklin selling sugary junk mere steps away from their Giant Heart exhibition that repeatedly stresses the importance of eating healthy foods? • Why is The Franklin pulling the same cheesy trick that roadside carnivals and supermarket check-out lines pull, namely, trying to shake the last few dollars out of you by sticking colorful impulse items between you and the exit? Leaving aside the fact that you can't bring food or drinks into the exhibition halls right next to the lobby, or that The Franklin has a perfectly fine restaurant (that sells actual food!) just outside the lobby, I just think The Franklin is better than this. Don't you? Have to say that maybe I want a blue slushi when I get out. A trip to a museum (especially if it is a children's or science center) often is a treat for us, and blue slushis would fit into a day of treats where we probably are off our normal routines. That being said it seems a little cheap, but I just can't begrudge the place because I know how much it costs to install that plastic heart, and how much health care is for the exhibition team. My big problem would be if it was a $9 slushi which is often common in carnivals and even museums. It is also ok for me to get in the habit of saying no. As my children grow, they will be faced with far worse than blue slushis. They should start ;earning how to deal with them now. I'll be waiting (and waiting...) to read the news that NYSHA has opened a Slushee Stand!